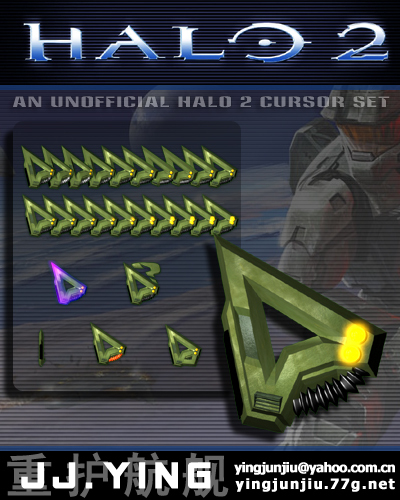 An unofficial Halo 2 cursor set for halo fans. If you save this theme as .zip file when download, please rename it to .curxptheme and apply in CXP instead of unzipping it. Man that is amazing, nice job!! I have never played the game Halo, I hear it's pretty cool. I downloaded the cursor because every cursor that I have used by you has been fantastic! and this one is no different!! You've done it again, great job. although in my opinion its a bit to big, but thats a personal thing. as always, the great master of cursors has done it again! I saved the zipfile in a separate folder and when I double click on it the file has to be unzipped somewhere. This is where I'm stuck! It should contain a CursorXP icon. I'm actually working on a wb skin, but it won't be released because I use the TSF's HALO 2 wmp skin to make it. But as I konw, someone else is working on a whole-new halo wb skin.